Ohh looks coold. Very striking and I really like all the lines. 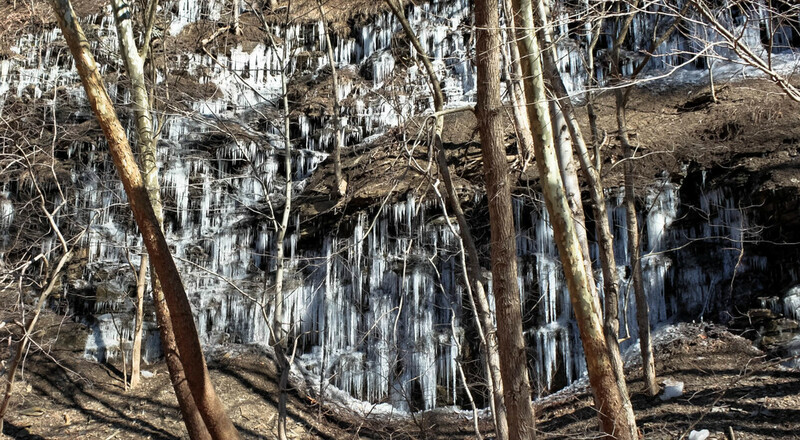 Always amazes me to see icicles on a hillside. It makes me think of how much water there is flowing underground. Looks beautiful icy, Great capture and find. Fav. Wow... so many icicles! Great captures. Wow- this is almost identical to the rock wall where my ice sculpture shot came from! Mine just didn't have the trees in the way because they'd been cleared for the road. Great catch! So many icicles - truly amazing! Awesome pic. A little sunshine and they would glitter. fav. Looks like an icicle wonderland! We never see them here.